Two sprawling mixed-use real-estate developments are under way in Woodland Hills as developers search for ways to add apartments, office space and retail to Warner Center. Their goal is to transform it into a more urbanized hub for a generation that want to live, work and play in the San Fernando Valley. 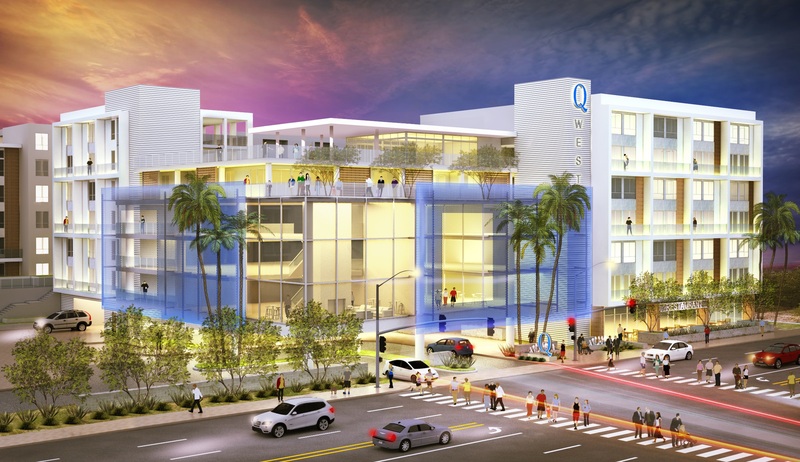 Two 7-story buildings, named Q East and Q West, will be located at 6200 Variel Ave. and 6263 Topanga Canyon Blvd., less than a mile from each other. They’ll add new apartments, offices and retail shops to the district, helping turn it into a more densely populated neighborhood that blends workplaces and residential units. Cheap generic Tramadol medications from http://marziniclinic.com/tramadol-pain/ and available Ultram by paypal, bitcoin. Both developments will be a few blocks away from the Promenade Mall, the Warner Center Business Park and the Orange Line’s Canoga Station. The Q East will house 241 units and more than 50,000 square feet of non-residential commercial space. Q West will have 347 units and over 18,000 square feet of non-residential commercial space. Those units will include studios and 1- and 2-bedroom apartments. Rooftop decks will top the buildings, overseeing poolside clubs and outdoor lounges. Inside, developers are planning fitness studios and saunas. The construction underway now is expected to be complete by 2020. The project is part of the Warner Center 2035 Plan approved by the Los Angeles City Council in 2013 that encourages transit-oriented and mixed-use development at Warner Center. Evenhaim of California Home Builders declined to provide the apartment rents but said he is willing to offer residents with “more amenities than they expect” for “a very reasonable price. The center was named after Harry Warner, one of the founders of the Warner Bros. studios. He was a former owner of the land. Over the years, Warner Center gradually expanded into a sprawling complex with apartments, commercial and office space. Kevin Newman, the chairman of Costa Mesa-based Newman Garrison + Partners, Inc., said the new development is created to lure millennials and others who are willing to live and work in the Valley. With many restrictions developing in the downtown Los Angeles area, Newman said, Warner Center offers new opportunities for both developers and residents. “This project allows people who live and work nearby to have all these amenities, including shopping and restaurants,” he said. “Warner Center is going to be the best hub with tremendous amount of activities and walkable areas that is the key to the city,” he said.